Many people who have studied diners believe they evolved from the night lunch carts that were manufactured in Worcester between 1890 and 1908 by T. H. Buckley. In fact, Buckley’s Worcester Lunch Car Company was one of a number of diner manufacturers in America, and it was not the first. 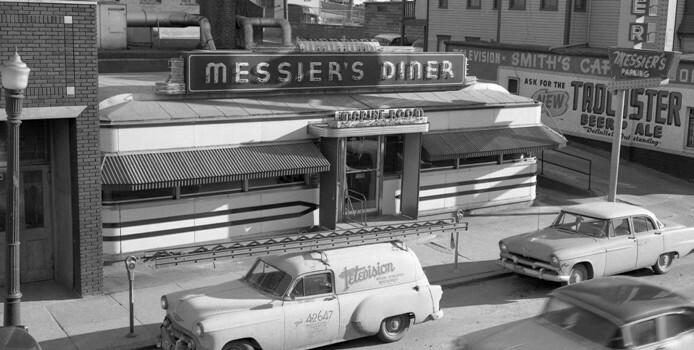 Diners were invented in the context of industrialization. Individual diners have always had their own special recipes, but “diner food” is also served in other kinds of restaurants. Diners were invented to serve meals to factory workers on the late shift. In recognition of this market niche, T. H. Buckley named his first cart the “Owl Café.” Today, many diners serve only breakfast and lunch. Early diners were built to serve factory employees near their work places, but diners soon became popular roadside cafés and downtown lunch places. Then and now, anyone can eat at a diner. Diners were built in factories and sold completely equipped, from stoves to silverware to hat racks. Diners were built with wheels so that they could be moved from factory to site. Many Worcester diners still have their wheels hidden underneath.